Blockchain has been compared to the creation of the internet for the extraordinary impact it could have. 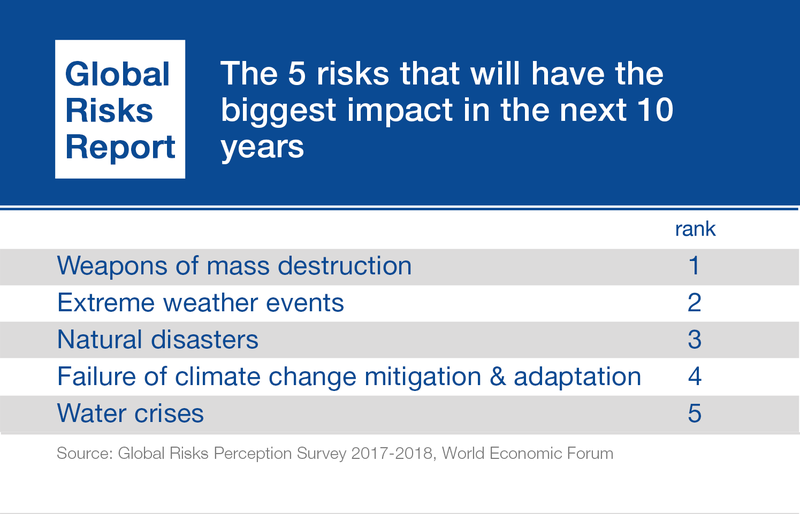 From biodiversity loss and ecosystem collapse to water crises and extreme weather events, most of the biggest risks identified in the World Economic Forum Global Risks Report are environmental. For example, blockchain has been introduced into the Pacific Islands’ tuna industry, to help stamp out illegal fishing and human rights abuses. This is the first such use of blockchain in the region, and was implemented by the WWF in partnership with global blockchain venture studio ConsenSys, ICT implementer TraSeable, and tuna fishing and processing company Sea Quest Fiji Ltd.
Blockchain is a digital, tamper-proof record of information, accessible to everyone. This means a simple scan of tuna packaging with a smartphone can reveal when and where the fish was caught, and by which vessel and fishing method. Consumers can be certain they are buying legally-caught sustainable tuna, free of slave labour. The platform Global Fishing Watch is also harnessing big data and recognizes the potential for blockchain to crack down on the $23 billion annual global cost of illegal fishing. These two examples show how new technologies can secure sustainability across the ocean economy - a $2.5 trillion market, according to WWF and strategic partner BCG. Besides seafood, blockchain can transform certification and traceability for all manner of commodities. It does so by tracking products from producer to consumer, by creating binding contracts without the need for third party enforcement, and by eradicating the manipulation of data on origin, content, production, and health and safety. Beyond supply change management, blockchain could be a game-changer in tackling numerous sustainability challenges and driving change across all sectors. Programmes such as Recycle to Coin and Plastic Bank are using blockchain to reward recycling with cryptographic tokens, as well as to track quantities, costs and impact. Such approaches, when expanded and replicated, can turbo-charge the development of circular and shared economies. Emerging platforms such as Electric Chain could help people invest directly in renewable energy installations. Blockchain could support a clean, resilient and affordable energy system that integrates centralised power with distributed renewables, taking energy from where it is produced to where it is needed with maximum efficiency. By tracking carbon footprint, blockchain could drive the production and consumption of low carbon products and help establish appropriate levels of carbon tax. And by tracking compliance with global environmental agreements – without the need for third party auditing – it could incentivise governments and corporations to deliver on commitments and reporting. Last but not least, blockchain can support civil society accountability by tracking funds and ensuring they support conservation, as well as by tackling bureaucracy and corruption, and releasing funds where needed without sophisticated banking infrastructure. In essence, blockchain is a distributed, transparent, autonomous and immutable peer-to-peer system for exchange. It can help individuals, governments and companies see the real impact of action in a complex world, which is especially useful in delivering sustainability. Dubbed a new operating system for society, blockchain has been compared to the creation of the internet for the extraordinary impact it could have on how we transfer things of value to each other. Yet while it has tremendous potential, the technology is in its infancy. We need to overcome potential weaknesses, and we need to experiment. We will likely need to fail before we grasp how to harness its power for a sustainable future. In doing so, we must remember that change does not happen by itself. Technology is no silver bullet. It will not magically protect forests, save tigers or restore ocean health. But used well, it can facilitate smart choices by producers and consumers, governments and corporations, whether for sustainable tuna, distributed energy, or other system change. Mission Earth is too big a challenge for one organisation, business or country to deliver alone. Along with robust regulation and public policy, it is only through dialogue, collaboration, commitment, innovation and imagination that we will succeed. Without these, bottom lines will be hit and our hopes of realising the Sustainable Development Goals and the Paris Agreement will be dashed. We should embrace the revolution. But beyond radical transparency, automation, smart contracting and elimination of uncertainty and blind trust, only the vision and ingenuity of people and partnerships can realise the true potential of blockchain technology for our wellbeing, future prosperity and enterprise.